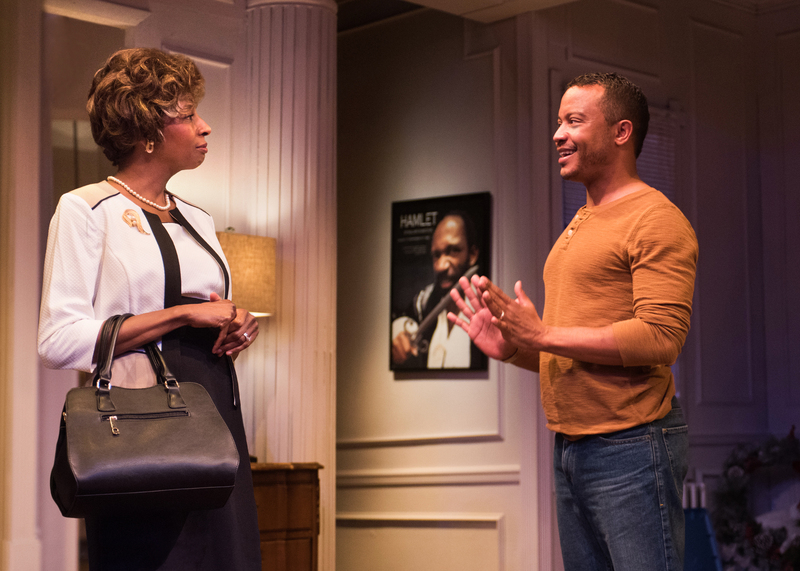 Velina Brown and Daniel Redmond in Terrence McNally’s “Mothers & Sons” at New Conservatory Theatre Center. Photo Credit: Lois Tema. Katherine Gerard’s son, Andre, died of AIDS twenty years ago, leaving her an embittered Dallas matron. She still blames Cal for Andre’s being gay and for getting the disease, two preposterous ideas that have ruined her life to this day. She remains rigid and unbending, refusing for a long time to take off her coat, sit down, or take a drink. Cal, on the other hand, has by now remarried another, younger man, Will Ogden (Daniel Redmond) who comes in with their eight year old son, Bud Ogden-Porter (Aviv D. Drobey), and bounces around the apartment like a lively teen-ager, himself. Cal and Will make a serious couple and their love has been hard won. The noted, multi-award winning American playwright Terrence McNally lets us see their success, their wit, their style, in the elegant furnishings of a swank uptown apt with a great view. The set by Kuo-Hao Lo puts us right in their carefully groomed home, beautifully symbolizing their success and their self-acceptance, too. The hit of the piece is Nance’s Cal, whom anyone would be glad to marry. Cal is polite, respectful, thoughtful, and caring: the perfect gay husband. We believe in him from the start, when he avoids confronting Katherine’s icy retorts. He tries to get through to Andre’s mother; he tells the truth. He takes good care of his writer husband and his bouncy kid. He gets Katherine to sit down and tell her side of the story — where she comes from, how she feels. But like much of America, she is still not going to change. She rehearses old wounds and makes new charges. She is stuck in her mourning for the past, even though she had rejected her son Andre for being gay in New York, decades ago. She forgives no one, least of all, herself. The story covers decades of the AIDS crisis, a veritable primer of tragedy, comedy, and recovery, full of New York jokes, quick repartee, and witty insights. We feel like we came to learn something from these open and closed minded people, to partake of their clashing opinions and opposing lives from Dallas and New York. McNally tells us that he is trying to keep the story of AIDS from being a mere paragraph in history books. The actors are all perfectly cast, with Velina Brown’s as sophisticated African American Katherine, and Daniel Redmond’s as super-confident African American young husband and father. Although race is never mentioned in the script, the cross-generation parental conflicts take on an added dimension with Director Arturo Catricala’s color blind casting. In this version, the confrontation between the depressed and bitter Mom and the smart yuppie husbands involves a subtle, racial component. However, they share privileged elite backgrounds and their debate is confined to prejudice against gays, whether black or white. The mother cannot even look, at first, at a poster of her dead son, who was a Shakespearean actor. Her distaste for and distance from Andre’s choices still rankle her, deeply. The problem for the actor is that the mother seems to swing from extreme anger to extreme depression. Maybe she’s on anti-depressants? It’s hard to grasp her character whole from these sharp mood swings. She’s a woman still in pieces, who may never recover herself because she still rejects those parts of her son, her self, and his lover that she always rejected. Her anger can remind us of Trump’s implacable anger; while Cal’s reason recalls Sanders’ logic. We are still in the world of argument based on deep-seated hatred versus debate based on love and rationality. Katherine Gerard’s anger roars on, through changing winds in the domestic scene, a comedy of manners with tragic undertones, until a sudden shift at the end. You will have to see for yourself how a charming entrance by Cal and Will’s son, Bud, and a clever choice of snacks makes for an abrupt ending to the dilemma. Since nothing is resolved, maybe the third generation, represented by Bud, can come to grips with the history of oppression that the play vividly recounts. “Mothers and Sons” by Terrence McNally plays at the New Conservatory Theatre Center, through April 3, 2016. For further information, click here. Director: Arturo Catricala. Sound Design: AudioZephyr. Costume Design: Keri Fitch. Stage Management: Toni Guidry. Lighting Design: Robert Hahn. Scenic Design: Kuo-Hao Lo. Casting: Ben Randle & Stephanie Desnoyers. Prop Design: Daniel Yelen. Cast: Katherine Gerard: Velina Brown. Bud Odgen-Porter: Aviv D. Drobey (Th-Sat-Sun) or, Dash Ferrero (Weds-Fri). Cal Porter: Andrew Nance. Will Ogden: Daniel Redmond. Posted in Reviews.Tagged Andrew Nance, Aviv D. Drobey, Barry David Horwitz, Charles Kruger, Daniel Redmond, Kuo-Hao Lo, New Conservatory Theatre Center, San Francisco bay area theater reviews, theatrestorm, Velina Brown.